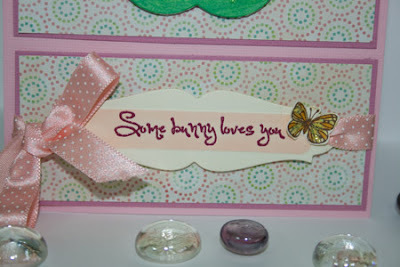 Hi Stampers, Welcome to the Spring Fling Blog Hop sponsored by Sparkle N Sprinkle!! If you hopped here from Julie's blog you are in the right place, if not you may want to start at the beginning at the SNS Blog here, that way you are can read about how to win! 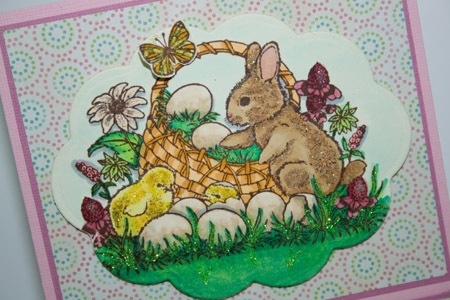 This is a brand new stamp set that was just revealed last week...it's called Celebrate Life....It is a great spring or Easter set and the images are so much fun to color and flock...I love soft bunnies, chicks and lambs!! I stamped the image on Ivory Neenah first to give it a softer look than white and colored with Copics. Then I used Brushable Glue and added a bit of Sparkle N Soft to the chicks and bunny...then glitter to the flowers and butterflies. I embossed the sentiment with Sangria embossing powder. Here are some close up looks at the details. Such a sweet card, Jill! Looks all "warm and fuzzy". This is quickly going to become one of my favorite stamp sets! Nice layering the coloring and glitter on this card. What an adorable Easter card Jill. I love the fuzzy bunny! Love the fuzzy bunny, Jill. Beautiful card! So sweet Jill and I really like the little butterfly at the bottom, such a nice touch! Wow, this just pops. What a cute card. What a cute fuzzy bunny card. Perfect for Easter. I love the paper and the bow. (How did you tie it so neatly)? What an adorable image! You have done an amazing job with this card! That's such an adorable stamp, Jill. Fabulous coloring and I love the paper you chose! Great Easter card. What a soft and gentle card!! I know my grandkids would love it - they save all the cards I make for them and I'm anxious to try this one. Jill there is something about every card you make puts a smile on my face THANX!!!!!! Thanks for sharing with us. I really like your choice of background paper and layout design of the card. Great spring colors to go with the sweet bunny and basket! Adorable! I have to check out the sparkle and soft to see what it is because I love the effect! Fantastic! The fir babies look like you could actually pet them. Thank you for sharing. What an adorable card! Love the swirly DP and the coloring on the image is beautiful! Love all the extra touches, too! Loved the soft look to the bunnies. The pictures are so clear you almost feel like you can touch them. Such a soft and cuddly card. Perfect to go with a huge basket of candy! I am loveing this stamp set, and your card is beautiful. That bunny looks sweet enough to cuddle. Lovely card! Cute spring image. Very pretty card! Love the color and soft look you added to your bunny with the flock ! Thanks for sharing. I love the fuzzy bunny & chicks. That stamp is adorable. Great card. Perfect use of the Sparkle N Soft. All the details are so pretty! nice job! I love the "hint of glitter" and how the dots in the ribbon mirror the background. Very nice! Got the stamp, now need the flocking! Great card, Jill. As always, beautiful cards. Love these. Very cute! I like how you can tell the bunny and chick have some softness to them even in the photo. Good choice of background paper. It matches perfectly. Love the mixture of different textures used; and of course the glitter on the flowers and butterflies just make it pop! Just love the sparkle and soft on the bunny and chick. What a nice springy stamp and great coloring. I just love the soft, sparkly bunny and chicks. A great card. Gorgeous card! I have something for you on my blog. I hope you'll stop by and pick it up. Great card.......beautiful colors and textures. Beautiful card. The soft colors are perfect. This is a beautiful card. I love the pink! Sorry I am late commenting-a bit under the weather. Your card is adorable. This new image is so much fun and I love how you added the Sparkle N Soft. Very sweet card Jill. Love how you only added the sparkle n soft to parts of the bunny & chick - just the right amount of texture & softness.